If you love cars, especially classic cars you must see this. If you love to see a film where the passion for a subject bleed off the screen and goes into you like a cinematic transfusion you must see this film. If you ever wanted to fall in love with a place you've probably never been you must see this film. Thank you Bent-Jorgen Perlmutt for making one hell of a film. Not only have you tweaked my love of cars and racing, but you've also made me fall in love with Cuba. This is the story of the return of auto racing to Cuba after a 50 plus year ban (it was considered an elitist sport). . Following a group of madly passionate gear heads over the course of two years as they ride the waves of official whims and try to make their illegal street racing legal. What can I say but this film had me smiling from ear to ear. I loved this film for any number of reasons. First there are the old cars. 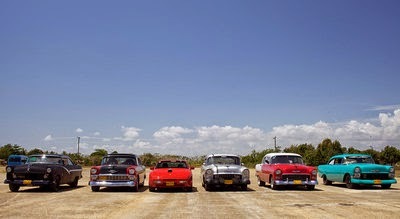 Cuba really doesn't have many new cars so most of the cars are 50 and 60 years old. When they are in the hands of men and women as passionate as these people are they are glorious works of art. Almost every car is just a thing of beauty-even the ones that aren't racing. Secondly there are the crazy guys and gals who race. Watching them work on their cars and argue among themselves with a passion that fills their soul makes you want to join them How could you not want to hang out with people who are this passionate? Hell even the fans are passionate as we see during races as the spectators try to get as close to the action as possible. Thirdly there is Cuba. I don't think that Perlmutt shot the country any way other then just pointing a camera and shooting, but what ever magic he worked made me home sick for a place I've never been. Havanna is now a place I desperately want to see in person. There is a beauty and a sense of being alive that I've never felt about a city on film. This film is pure magic. Even when the film bumps oddly through time and events we are still carried along, we are still made to feel good. I love this film a great deal. Go see it.